Twelve Days of Christmas Giveaway!!! To celebrate the season of giving as well as the earlier than expected release of my new book I’m going to give away signed copies of all three of my books as well as some artist quality prints of some of the artwork from my new book!!! This will be the biggest giveaway this year!!! A total of SIX BOOKS and SIX ART PRINTS (8×10 Somerset Velvet Giclee Art Prints) to TWELVE LUCKY WINNERS!!! That’s TWELVE chances to win for The Twelve Days of Christmas Giving!!! All you have to do is leave a comment! Already have one or more of my books, well consider paying it forward and giving your copy away to a friend or on a blog post if you win!! Pass the giving along. The copies of my newest book, Mixed Media Portraits with Pam Carriker will be shipped as soon as my advance copies get here around the end of January. You’ll be the first to get your hands on a copy!! The drawing for winners will be done on Monday, December 15th and announced on my blog in a new post so be sure to check back to see if you’ve won! Please be sure to include a way to contact you in your comment as well. « BIG News!!! Christmas Comes Early! Congratulations on your new book – I have Art at the Speed of Life and have also bought it for friends…I am a mixed media artist and portraits are a favorite – I can’t wait to see your new book. Love your first book! I’m now willing to play with the others! Congratulations on this new book! Congratulations on your new book. This is so exciting. In the past, I would never have even tried a portrait. I still have lots to learn yet and practice needed but you have opened up a world of possibilities for me. I love your book. Congrats on our new one! Wowee, this would make for such a blessing for the end of a very hard 2014, and perhaps a much better 2015. Would love your book on portraits but would love your prints or other book. Thank you so much. Wowee, to win a book or print of yours would be such a blessing for the end of 2014 and a great start for 2015 for 2014 was extremely filled with hardship. Maybe 2015 will be better. Thank you. Wowee, to win a book or print from you would be A blessing for the end of 2014, beginning 2015 and maybe start a nice new year, for this past year has been very difficult. Thank you ! So exciting! I would be absolutely thrilled to learn from one of your books or to have a print of your inspirational art in our home. Thanks so much for the opportunity. Have a merry christmas! Would love to win, find your art very inspiring! Hi Pam, I have ART AT THE SPEED OF LIFE which I liked very much. It’s always fun and inspiring to follow an artist’s words and work. Congratulations on the new book. Of course, I would to win a surprise from you. Hi Pam, I would love to enter your giveaway to win your inspiring books! Thank you for the opportunity! I love your work! I am an art teacher and include your ideas and art in my lesson plans. Thank you for Sharing your art through your books! This is a wonderful treat !! Thank You …. Can’t wait for the new book to arrive! Love love a print or book! oh would love any one of these! Congratulations Lesli!! You are one of the twelve winners!! Please email me at pamcarriker@gmail.com to claim your prize! I can’t wait to see your new book!! I love your work! What a great idea, Pam! Love all of your work, but most admire how you teach and inspire us all to achieve our own vision in our art. Thank you. Merry Christmas Pam and congratulations on your new book. I’d love to win one of your wonderful giveaways.Thanks for the opportunity to win. Wish me luck. I love the first two books. Enjoyed meeting you at CHA. And you litle tips of encouragement whenev w e i email you. I’m a huge fan of your art and teaching skills! You have helped me embrace mixed media and learn the joys of art journaling! Thank you. What a great giveaway! Thanks! I go back time and again to Art at The Speed of Life. It’s wonderful. Looking forward to your newest book! Happy Holidays! Would love a chance to win. Your artwork is beautiful. I love your book Art At The Speed Of Life which I purchase as soon as it was released. It would be wonderful to give the it as a gift this Christmas which is what I would do with the new one if I wond the giveaway. Keep inspiring! Yippee eye oh ky yea! Would love your lovely book! thank you for using concise teaching instructions that are easy to follow!! I love all your books and products, everything works like magic!!! You have had lots of comments……your books are very interesting and obviously liked by many. Such a beautiful giveaway Pam… you inspire me constantly…. I am so inspired by your beautiful artwork, Pam. Thanks for this great give-away opportunity. Merry Christmas!! Love your book, Art at the speed of life. Very inspiring! Took a class with you at Create Dallas! Love your work. Thanks for teaching me about faces. Can’t wait for your new book! I am so inspired your vision of materials and colors…would love to have a copy of all three! I am a great admirer of your work and would love a chance at the giveaway… Thanks!! Congratulations Kim!! You are one of the twelve winners!! Please email me at pamcarriker@gmail.com to claim your prize! I would love to be entered into your very generous giveaway! I love your work and learning from your expertise would be amazing! Thanks so much!!! Pam, I own your first two books and am waiting (impatiently) for your new book! I am such a fan of your work and you’ve given me the belief that I can build my confidence in drawing faces! You are an inspiration! What a X-mas present! Love your art & enjoy your teaching. Both are exciting, informative & refreshing. Holy Moly! What a generous giveaway! What a great giveaway! I would love to win any one of your lovely prizes! Hi Pam, what an amazing gift. I have your new book on order so it would be wonderful to win the gift. Love your work and inspiration offered to everyone. The possibility of have all 3 books by you is mind blowing. Thank you for being so generous. Keep creating ladies , regards Heather from sunny South Africa. Love your work Pam. You are such a kind instructor, and your products are fantastic! One can never have too many Pam books! Congratulations Christy!! You are one of the twelve winners!! Please email me at pamcarriker@gmail.com to claim your prize! Pam, what a great Christmas gift for 12 lucky people! I love your work, have several of your stencils and I’m trying hard to paint faces — hopefully I’m one of the lucky 12! I am a big admirer of your work. I have 2 DVD’s, but will love one of your books! Hope I can win a copy of your new book as I want to start drawing faces. If not, then maybe I can win the first book which I haven’t purchased yet. Got the second book but on my Kindle, so it would be difficult to give it away. (Don’t know the procedure involved in transferring ownership of a Kindle book or it that’s even legal to do. I’d want to keep the signed book if I got a copy of the only book of yours that I have now. I’m sure I will eventually get them all because your books are so helpful. 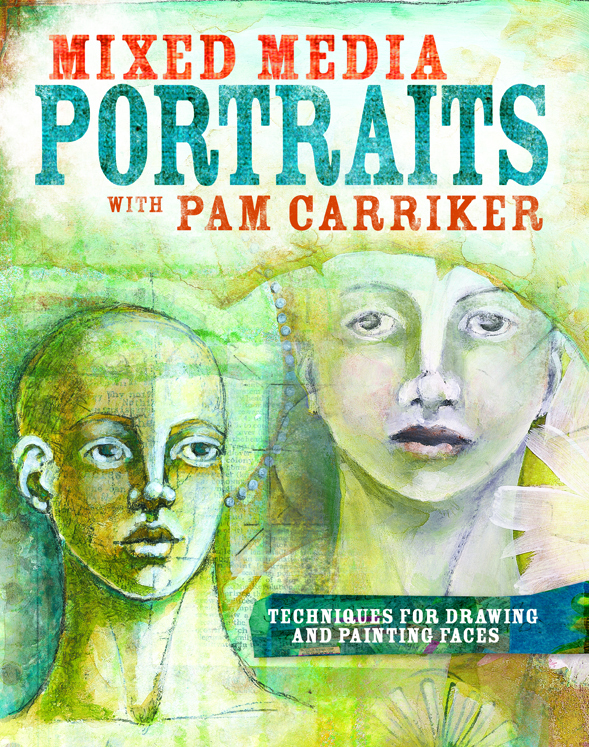 Pam – your first 2 books (which I do already have and will happily gift forward) and portrait video have inspired and encouraged me to draw faces – something I’ve always steered away from, so I would really love your new book to help me on my portrait journey. Even if I’m not lucky this time – thankyou for the new book, can’t wait to see it! Have a wonderful Christmas. Congratulations Kerrie!! You are one of the twelve winners!! Please email me at pamcarriker@gmail.com to claim your prize! Would love to win a book or your art!!! Thanks for the chance Pam! Would also love to see you teach in Portland, OR! Moved your class in Irvine at CREATE! Tx! Pam, I would love to know how you draw and paint your portraits! I have admired your style for so long. I am so glad you have a book coming out. It must be so exciting for you, even if it is your third book. I would love to spend winter learning how to draw portraits like you do. Thank you for giving us the chance to win one of your books. I was going to buy your book – so free would be a Christmas surprise! Hope to see you teach in Portland, OR soon! Loved my time with you in Irvine! Tx Pam! Happy holidays to you and your family. Many blessings in the New Year. Love the lettering on your book covers. Thanks for a great giveaway. What an amazingly wonderful giveaway. Thank you so much for a chance to win. Oh my goodness! What a fabulous and generous giveaway! And the perfect gift to myself to put under the tree! Thanks for a chance! Hats off and big thanks to a talented and well respected artist who is an inspiration to all of us. Thx for the chance to win! I LOVE your work and hope to take a live class from you one day. This is a generous and wonderful giveaway. Yes, you are going to pick me! Hug a teacher day! Love your style and would be honored to win one of your books or some of your art. Your style rocks! Pam your amazing! Thanks for the opportunity to win! I would be amazing to win and be able to learn from you! Thank you! I would love to have one of your books. I purchased a cd but not the book yet. Thanks for the generous giveaway. Thank you for your gift to the world through your art – it touches mine, and many hearts. What wonderful holiday gifts! I have your first book and have pre-ordered your third. Can’t think of a better gift than to win a signed copy from you of any of your books or prints! Thank you so much for the chance to win one of your great books! Congratulations Rhelda!! You are one of the twelve winners!! Please email me at pamcarriker@gmail.com to claim your prize! I’ve followed you from the beginning, you are a great inspiration! Thanks for the chance to win your new book package. Looks like a nice giveaway! I’d love one of your books. What a wonderful giveaway! Thank you so much for the opportunity to win. How exciting! A chance to win! I loved copying your drawings you did every day for a month a few years ago. It really helped by drawing so I bought your first book! I have a well worn (loved) copy of Art at the Speed of Life. Thank you for an chance to win! The new book looks great; have always admired your artwork. I love ‘Art at the Speed of Life’ and the ‘Creating’ one as well..really would like to learn more about drawing faces..thanks for the chance to win! Thanks so much! Can’t wait to see your new book. Thank you for the chance to win and for all the inspiration you provide! Congratulations !! You are one of the twelve winners!! Please email me at pamcarriker@gmail.com to claim your prize! Have your first book & love it! I’m in Canada …but I would pay shipping if I can enter the contest. What else is there to do in Canada in December but read and paint!!! I do it even with frozen fingers!! Very cool, love these books WOW Thanks for the giveaway. Merry Christmas. Pam, this is a wonderful opportunity. Of course I would live to win any of these great prizes. Whoever the winners are, will be some lucky artists! Thanks for the opportunity! I would love to win. Oh boy! Would I LOVE to win one of these great prizes. I have loved your first book ! Thank you for your books, they keep me going forward. I am looking forward to this one as faces are so fascinating, they speak out so much. You have such a wonderful gift and it is incredible how you are so generous with it. Fabulous doesn’t begin to cover it! I’m so excited for the opportunity to win an art treasure! Oh, what fun!!! This would be a fun prize to receive. Love your art. Congratulations April!! You are one of the twelve winners!! Please email me at pamcarriker@gmail.com to claim your prize! I have the first two books and love them. Would definitely pay it forward. Journaling is new to me and I have learned a lot if fun techniques! Thanks! Pam, this is so generous of you. Thank you, love your art. Congratulations Pam for your new book and thanks for this great give away! Love your art and would love to win something. Merry Christmas! Awesome giveaway Pam – thank you for your generosity. I hope I win one. Merry Christmas to you and yours. xo. Oh my gosh! All three of your books are on my Christmas list. I would absolutely love to win one of your books. Have a happy and Merry Christmas! Awesome! Thank you Pam for your great inspiration! Thank you, thank you Pam! Would love to win your newest book for myself or to gift one of the other books to a friend! Merry Christmas! So looking forward to the new book! ! Yay! I have your first book and love it! Cant wait to get the new one, it looks even more awesome! Thanks for the chance to get my painty fingers on some of your awesomness! Your blog reminds me that there are NO EXCUSES to not fulfill my art resolutions for 2015. What an awesome giveaway!!! I do indeed own your books, but they have inspired me more than any other art books I have purchased so far! I would definitely pay it forward! My Christmas wish list has mostly just art supplies. Now I will have to include a giveaway from Pam Carriker. Merry Christmas to you and your family! Merry Christmas and Happy New Year! Love your work and hope to win so I can pass on the books I already have. I would be overjoyed to be chosen…..your work is amazing! Thank you. I love this time of year – there are so many generous people giving things away – and you, my friend, are so giving – thanks so much. I do have the Art At the Speed of Life 30 days of creating, and I would love your new one!! Thanks for the chance!! Have a wonderful holiday. Look forward to getting your book. Congratulations Sandy!! You are one of the twelve winners!! Please email me at pamcarriker@gmail.com to claim your prize! Faces, faces, faces! I love those faces! It is so kind of you to do these give aways! Thank you for all of your hard work, your beautiful work and all of the inspiration. Congratulations Judi!! You are one of the twelve winners!! Please email me at pamcarriker@gmail.com to claim your prize! Wow! What a fabulous giveaway, thanks for the chance of winning! Festive Greetings! Oh wow, great giveaway!! I already own your Creating Art at the Speed of Life and I love it. I would love to win your new release. Afterall, you taught me how to create faces! Congratulations on your new release! Happy Holidays!! Such a fantastic giveaway! Thank you for hosting! How generous. I always loved your first Speed of Life book – starting with the title. And have a happy holiday season, yourself. Pam, thank you for this amazing opportunity and I promise to re-gift the new copies of your first two books since I have notes written in mine and won’t give them away! Thanks so much for your giving spirit! May you have a wonderful holiday! Your books are so inspirational! I love them! Thanks for the opportunity to win! Love your teaching and inspiration. this would be a fun gift from Santa…love all your books and articles…looking forward to more…new stencils are the greatest and are on my gift list for Christmas or any time…thanks for all your inspiring art…Jeannie! Congrats on the new book Pam! I would love to win something. Thanks for the great give-away! Seriously, how incredible generous are you Pam. Yes, please put my name in the hat. I would be honored to receive such an amazing package. Congratulations Judy!! You are one of the twelve winners!! Please email me at pamcarriker@gmail.com to claim your prize! What a fabulous giveaway! So generous. I love your books! I have your first book, and can’t wait to get your newest book on portraits. Thanks for the chance to win! Merry Christmas! Thank you for sharing your inspiration this holiday season! Your books are beautiful and always help pull me out of creative ruts! That is truly an amazing gift. Thank you, Pam! I have your fabulous first book, but would love to have all the others. This is very exciting!! Thanks for a chance at your wonderful giveaway ~ what a treat for 12 lucky people! wonderful to get in the Christmas spirit! i am hoping for one of your art prints or your last book as i already have your first two books…..thank you for this great opportunity and happy holidays to you! You are so generous during this giving season. I’d be thrilled to be on the receiving end of any one of your books or prints. Have a Merry and Bright Christmas! Oh, how exciting! I can’t wait to see your new book – maybe I’ll win one. In any event I’m sure I will get my hands on a copy! Love your books, thanks for the book give away! Fabulous, already own one of your books and delighted to have chance to win one, HAPPY Christmas to all. Your very generous with your books and sharing your knowledge. I would be overwhelmed if I was a winner. I’ve got my fingers crossed. Thanks Pam for the chance to win one of your books or print. I love your art so would be delighted to win! I love Pam’s art! She is a great teacher too! I love your art and your books! Thank you for the chance to win and I can’t wait to get my hands on your new book! Wow – amazing giveaway Pam! I am really looking forward to the release of your new book. “Art at the Speed of Life” is my favorite go-to book for inspiration (currently have a journal project from it on my work table). So excited to learn you will be teaching at Ephemera Paducah in the spring! Thank you so much for this opportunity! 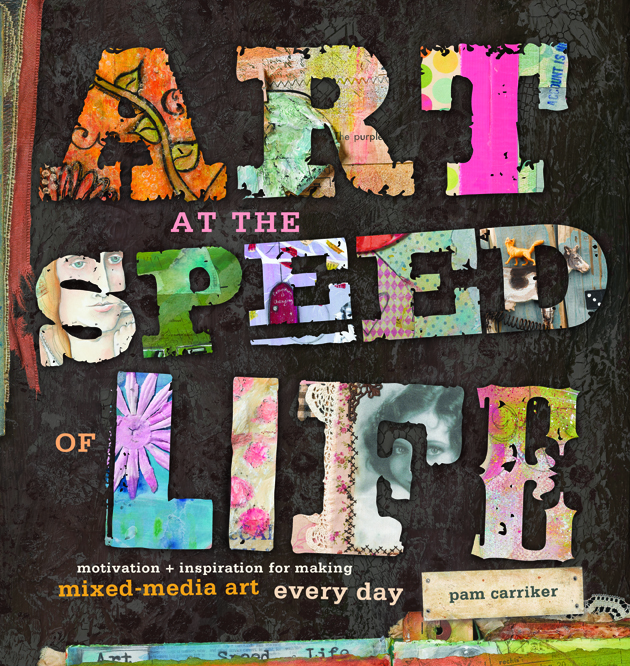 I´m the proud owner of “Creating Art at the Speed of Life” and would love to win any of your other books. Merry Christmas to you! please please please let it be me!!! I’d be so happy to receive such a wonderful gift!!! Love you art. Already have “Art at the Speed of Light,” so would like to give that to someone else, but would put your other two to good use! Thank you for your generosity. I have your book Creating Art at the Speed of Life and really like it so I am hoping you will be my Santa and send me a copy of Mixed Media Portraits! I promise I have been good. Thanks for the opportunity! I would love to win and would be more than happy to pay it forward. I am looking forward to seeing your new book and enjoy the copy I have of your first bookk. Happy Holidays! I splurged and bought your Art at the Speed of Life book and have been working my way through it. I really admire how talented you are — when I grow up I want to be just like you! My biggest problem is that I want everything to be asymetrical and not sloppy, but I am learning to let go and make a mess. Congratulations Lila!! You are one of the twelve winners!! Please email me at pamcarriker@gmail.com to claim your prize! What a fabulous gift! I have your first book and already order the new one – but if I win, I have friends who would be THRILLED to have a copy! I also have your first book. Love it. Passing it along would be no problem. I have many friends who are into mixed media. Wishing you a Merry Christmas and all the best in the New Year. I love your art and would love to win one of the prizes. love love love your books and your art! I have your DVD and enjoyed it immensely. Would love your books as well! Happy Holidays and thank you for this wonderful giveaway! Thanks for the giveaway! I have your first book. I would love the new book. Happy Holidays. WOW! I’d love a chance to win this awesome giveaway! Merry Christmas! What a fantastic giveaway!!!! Would love to win!!! Thanks!! What a great giveaway! I’d love to win ANY of the options! I return to both of the books often to get reenergized or remind myself of a favorite process. I plug in the DVDs from Still Pursuing Portraits often so am totally looking forward to the new book! Pick me, pick me! Thank you for this chance to win your book or a print. Would love either. I love your art and would love to win one of the prizes! Thanks for the opportunity! What wonderful gifts for some lucky people! Smiling faces! Hearts all aglow! Thank you so much for the generous sharing of your books and art. Counting the days until your newest book is released. In the meantime, thanks so much for your generosity of spirit and talent all year round – year after year! Since I am new to art journaling and such, I haven’t had the chance to check these out. But I do have these in my wishlist! I do have your first book and it’s a keeper! Wonderful book! The newest book has been on my wish list for awhile, and I would love to have a copy! Thank you for a great giveaway! Merry Christmas! Congratulations Maeve!! You are one of the twelve winners!! Please email me at pamcarriker@gmail.com to claim your prize! Fun! Would love to win something from you-one of your books or a print.